I had the opportunity to visit Plant Delights Nursery's winter open house this weekend. Even though it was the winter open house, it really felt like late spring or early summer. The temperature got up to 80 degrees, and it was so nice to have a spring like day to peruse the hellebores in bloom. 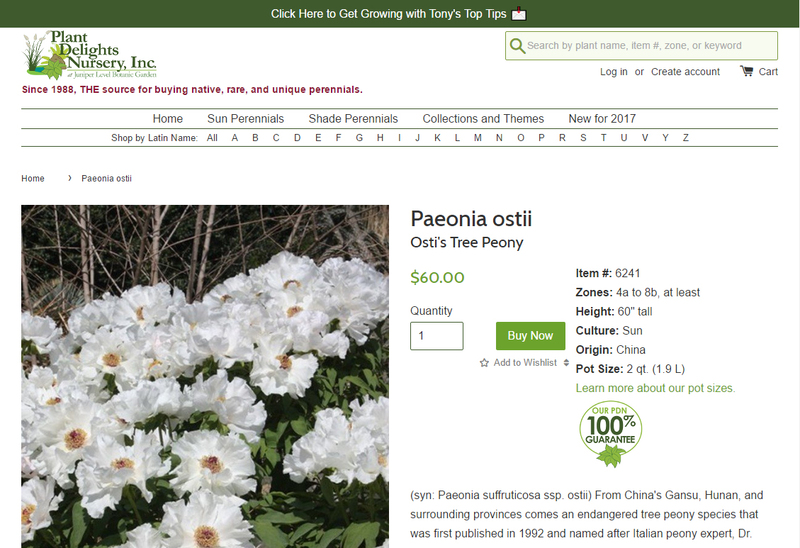 I wasn't even planning to look at the peonies, even though I did notice that Tony introduced a new peony for the first time ever in his spring catalog (Peony 'Golden Sunrise'). However, I just happened by a wonderful tree peony in bloom, and it smelled so good! Someone had pulled it out of its greenhouse, and it was sitting near the checkout lane. It turned out to be a Paeonia ostii seedling, and lucky for me there were several of them in the greenhouse and a couple that still had blooms on them. Needless to say one of them made the ride home with me, and perfumed by car during the whole trip! The scent on this tree peony is just heavenly! If you hadn't noticed yet, the American Peony Society will be taking a tour of Plant Delights Nursery and Juniper Level Botanic garden during the 2017 APS Annual Convention. If you haven't yet made your plans to join us, now is the time to get your registration in! You might actually end up taking one of these awesome tree peonies (and likely several more plant friends too) home with you from the conference. 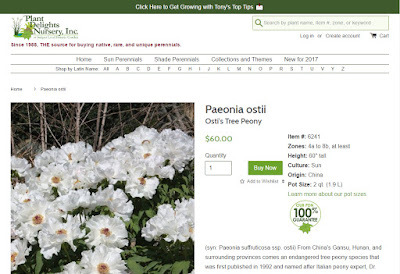 ;-) If you'd like to know more about this Paeonia ostii species tree peony, take a look below at the catalog description from Plant Delight's Nursery's online catalog. (syn: Paeonia suffruticosa ssp. ostii) From China's Gansu, Hunan, and surrounding provinces comes an endangered tree peony species that was first published in 1992 and named after Italian peony expert, Dr. Gian Lupo Osti. Similar to Paeonia rockii, the 5' tall Paeonia ostii has narrower leaves and is topped in very early spring (mid-April in NC) with over 100 large, 6-8" wide, sweetly fragrant flowers. Paeonia ostii is unquestionably one of the finest peonies we've ever grown. Flower color ranges from white to pale pink, highlighted by a dark red central blotch and bright yellow stamens. Our plants are flowering-sized plants grown in the US. Interestingly, the 2004 publication, "The Genus Paeonia" says, "This is another recently established Chinese taxon that has not yet been introduced in the West." What is the difference between P. Ostii and Phoenix White or Feng Dan Bai? It'll be interesting to compare the 2 side by side with your Phoenix White from your recently shared pics! Since this is my first time growing this P. ostii plant, I'm not quite sure. However I will have to compare them to see what differences I notice. I know this one has a small pink tint to it that becomes more evident towards the center. However I'm pretty sure my 'White Phoenix' does not have this pink tint. Also I'm curious to see if the scent is the same as well. This P. ostii could perfume my whole car with just one bloom! What are the differences between this peony and "Phoenix White"? Take a look at the photos for yourself. This one definitely has a pink cast to it, while the 'White Phoenix' seems to be much more pure white. I'll be keeping my eye out for any other differences I notice. Interesting. I'll have to keep an eye on my 'White Pheonix' 鳳丹白 'Feng Dan Bai' to see if it ever changes color. I've only seen it bloom twice now, but have not noticed any pink in it. I'm guessing it is probably not cold enough here for it to die back to the ground. The 'Phoenix Pink' 鳳丹粉 'Feng Dan Fen' looks interesting. I'm wondering if it is really that pink. I see from their blog, there is also such thing as a 'Phoenix Purple' 鳳丹紫 'Feng Dan Zi'. I wonder if they've offered that one for sale?